Steinhatchee Falls isn’t a huge cataract like that at Niagara, but it’s a great spot to picnic and enjoy nature! Steinhatchee Falls is a great place to picnic or enjoy a quiet moment watching the river cascade over the falls. The three-foot waterfall is formed by a limerock outcropping in the river which extends north of the falls and, historically, served as a crossing point for Native Americans and settlers in the 1800’s. At one time this was a crossing for vehicles before there were bridges, the flat natural bridge extends completely across the river and the water is only a few inches deep on top of the flat rock shelf. Traces of the old road are still there. Drive up CR361 from Steinhatchee to the falls and enjoy the day for a picnic or an afternoon bar-b-que. This is the place. A quiet and serene setting to relax and enjoy some of the Nature Coast’s most beautiful scenery. The park is on the banks of the beautiful Steinhatchee River. A favorite spot for locals for many years. You might try you luck at fishing in the in the fresh water or go for a swim in the river. Its strongly recommended that caution should be exercised when swimming. The water is turbulent and dark with a rocky bottom. Children should be well supervised for safety’s sake. There is a boat ramp where a kayak or canoe can be launched. 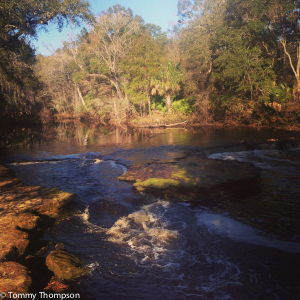 A canoe trip down the scenic river will reveal the beauty of nature in the real outback of Florida. Bring along some bug repellant for mosquitoes and we have no see em’s. Always be careful to watch out for snakes and alligators, rarely seen but this park is in a wildlife area which is a part of the Steinhatchee River swamp. A nice park to spend the day or maybe just a couple of hours. Definitely worth a visit if you are in the area and want to see the real Florida and all that the Nature Coast has to offer. Consider renting a kayak from the folks at River Haven Marina in Steinhatchee. They offer full-day rentals as well as livery to the Falls!